I’ve been getting ready to unload some of our things at a garage sale. The sale is on Saturday, and I’ve got a pretty full calendar between now and the weekend, so I’ve been working quickly to clean out my closets. It can be a challenge for a cheapskate like me to get rid of things. After all, I might need these items someday, and it would be a tragedy to have to pay money for something that I used to own. As I’ve gotten older, I’ve realized that having a lot of stuff laying around the house, actually costs me more money than selling something and regretting it later. When you can’t find something, it’s as good as gone already. Do I have something else that could do the job of this item? What’s the worst that could happen if I sold this item? What’s the best thing that could happen if I sold this item? There is a real tendency for people to keep things out of obligation. The item either cost a lot to begin with or was received as a gift. Keeping something out of obligation means that you’re letting your stuff control you. It doesn’t matter if the item cost a lot when you bought it, because that money is long gone now. And you’re not using the item. So sell it. Don’t tell people what you paid for the item, because we all know that it’s not worth that much now. Get a little bit of cash now, and reclaim the space. It doesn’t matter if your Great Aunt Edna gave you that clock if you keep it in the closet and only pull it out when she comes to visit. Get rid of the clock, and get rid of the guilt. Getting rid of stuff you don’t want doesn’t mean you love the person who gave it to you any less. I’ll definitely try to get rid of anything and everything we don’t use or need anymore, but I’ll be focusing on the above list as I go through the house and garage. This year, my boys, ages 7, 4, and 4, got involved in the process. I feared I would have to bribe them in order to part with some of the things they don’t play with anymore, but they were actually quite willing participants. They picked out a lot of toys and puzzles to sell, and made compelling cases for wanting to a keep a few things I thought should go. I made no formal promises, only a promise that we would do something special with the money we make at the sale. Already, I’m thinking the money will go toward our family room makeover. 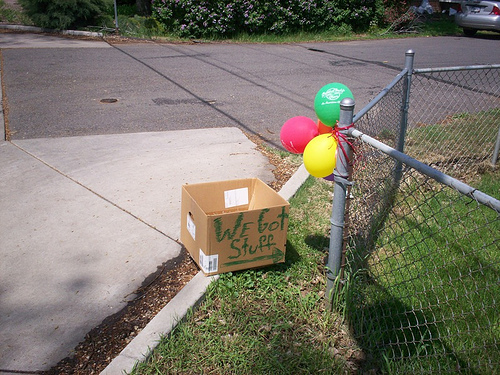 I’ve been brainstorming some changes I’d like to make, starting with getting rid of a bunch of toy clutter in a garage sale. I think they boys will like the finished project. And now, I’m off to price some more things. How do you decide what to sell at garage sales? My issue is: “I’d better hang onto those pants–they don’t fit now, but once I lose that 15 pounds, I’ll be glad I have them!” Um. Yeah, right. In the unlikely event I lose the 15 pounds, I’ll treat myself to a new pair of pants. Or three. I’ve gotten into the habit of keeping things for a cycle of seasons and then giving up on them if I haven’t worn them during that time. I am also guilty of this. I also have a rather large collection of denim that I plan to turn into a quilt someday. After I re-teach myself to sew. And learn to quilt.